Background: Saliva is a clear and complex biological fluid with pH value in the range of 6.0 – 7.0 that is produced from three main salivary glands. Recently, saliva has been recognized as a noninvasive diagnostic tool for surveillance of disease and in healthcare research and promotion since saliva is able to indicate a wide range of health and disease conditions with distinctive advantages over serum. 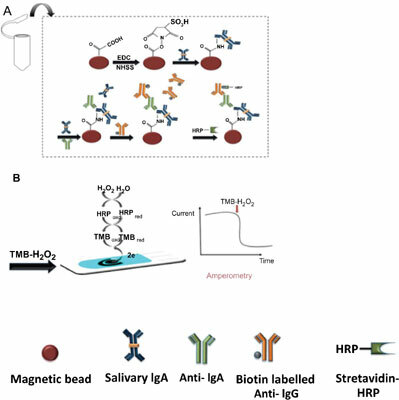 In this study, we have fabricated an electrochemical immunosensor for sensitive detection of salivary immunoglobulin A (sIgA) based on indirect competitive format and using magnetic beads (MBs) as reaction carrier. Methods: Firstly, carboxylic modified MBs were covalently attached to sIgA with N-(3- dimethylaminopropyl)- N’-ethylcarbodiimide and N-hydroxysulfosuccinimide. Then, the sIgA immobilized on MBs and free sIgA in solution was allowed to compete with each other for fixed amount of primary antibody. Upon the formation of immunocomplex, biotin-conjugated secondary antibody was incubated with the modified MBs following affinity binding with streptavidin-hydrogen peroxidase. For amperometric measurement, the resulting MBs were immobilized onto the surface of single-walled carbon nanotube working electrode with a strong external magnet and subsequently 3,3’,5,5’,- tetramethylbenzidine and hydrogen peroxide were introduced that functioned as electron transfer mediator and as enzyme substrate, respectively. Results: The proposed MB-based immunosensor demonstrated a wide linear range of 5 pg/mL – 10 ng/mL and a low detection limit of 5 pg/mL with excellent reproducibility. Conclusion: The developed immunosensor has great potential for clinical diagnostic application to monitor sIgA in field setting. Salivary immunoglobulin A, magnetic beads, amperometric immunosensor, indirect competitive immunoassay format, carboxylic modified MBs, antibody.